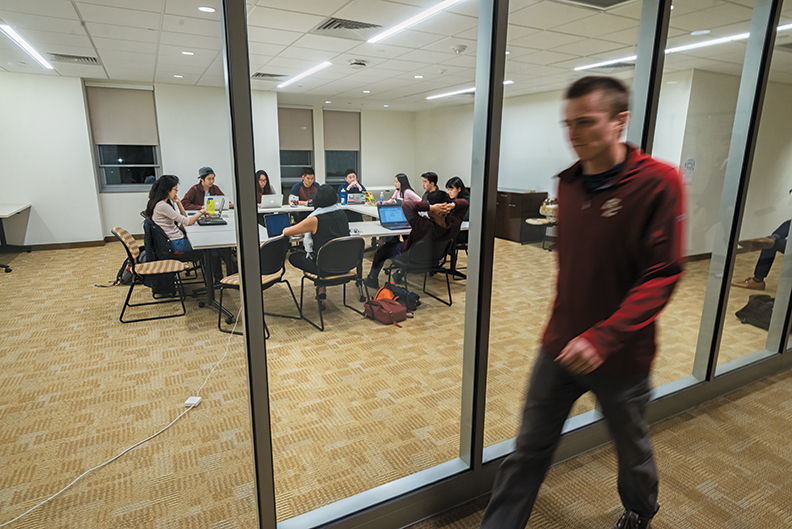 Opened in 1975, the 240,000-square-foot Edmond’s housed 790 students and a single study lounge. The five-story Thomas More, located at the corner of Commonwealth Avenue and St. Thomas More Drive, has the same square footage, but houses slightly more than half that number—490 students—and features 11 study rooms, six two-story lounges, three soundproof practice rooms, two seminar rooms, a reflection and prayer room, and a 90-seat conference room. 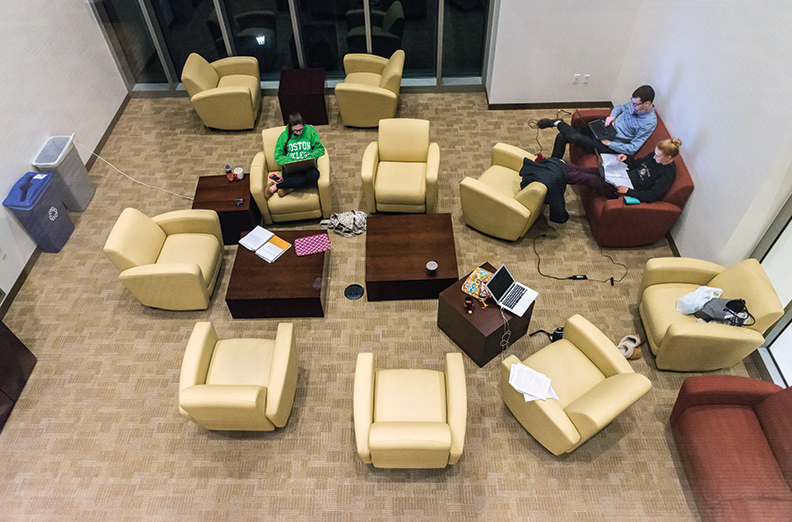 These spaces are open to residents and may be reserved by student groups. Most contain floor-to-ceiling windows with views of Lower Campus, Gasson Tower, and Brighton Campus. 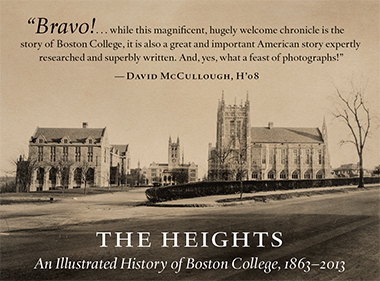 The two buildings illustrate the evolution of housing on the Heights. 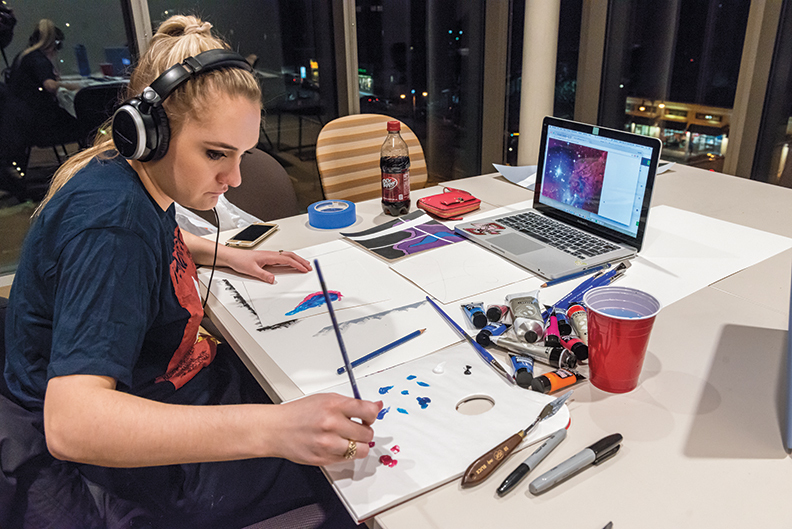 Since the first three brick-and-timber, barracks-style dormitories (Claver, Loyola, and Xavier) were built on Upper Campus in 1955, the University has inched toward a more “formative” approach to its students’ living spaces. Moreover, there had been a tradition of Jesuit prefects regimenting times to rise and retire, eat, attend Mass, and study, during which “students must avoid all unnecessary moving about and remain in their rooms,” according to a 1955 handbook. Forbidden were “books of questionable character” and all “lady visitors, even mothers and sisters.” Appleyard, who later became an English professor and the University’s first vice president for mission and ministry, suggested loosening some of the more severe rules, including residents’ nightly sign-in. Over the next half century, the University seemed to heed this instruction, albeit in fits and starts. While plans for twin 22-story towers on Lower Campus were eliminated a month after they were unveiled in 1969, the ramshackle (and beloved) Mods, a “temporary” solution to a housing shortage in 1970, still offer shower closets and bedrooms with one shared desk. But 1988 brought Vouté and Gabelli and their duplexes with spacious living rooms. 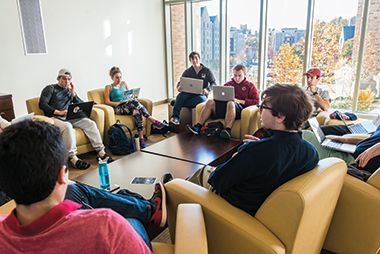 Vanderslice and 90 St. Thomas More Drive, both built in 1993, include top-floor lounges, a piano room, and a study room on every floor. 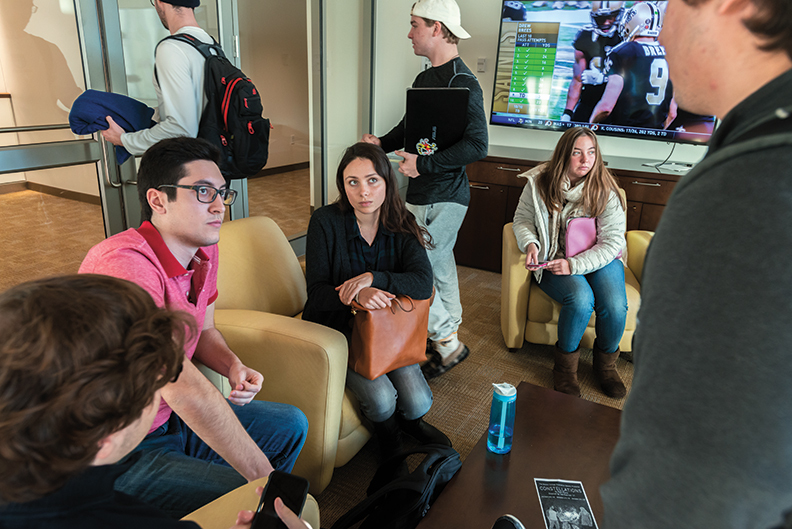 The granite and limestone Stayer, the last residence hall built before Thomas More, in 2004, features a top-floor, sky-lit commons and two stacks of glass study lounges from the second floor to the sixth floor. 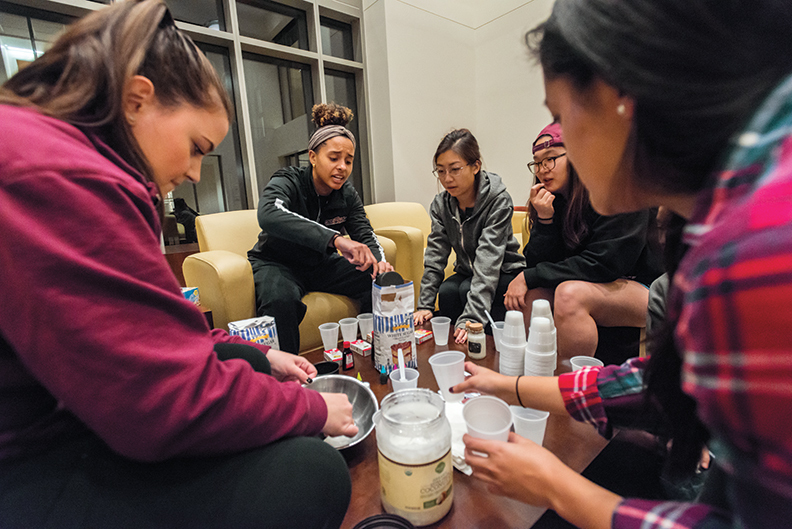 Since 2013, the University has renovated 15 residence halls, adding rooms dedicated to study, formal meetings, and reflection. Completed in the spring of 2016 on the former site of More Hall, Thomas More Apartments is a product of the Light the World campaign’s strategic initiative to improve student formation, which Appleyard co-led. Portraits of this residence’s life follow. “Oh, yes you are,” says Isabella Valentini ’17, cochair of the summit. Willet rattles them off rapid-fire, “PolkTaylorFillmorePierce.” Not everyone pays attention. Some study the meeting agenda. But the applause and whoops bounce off the cavernous ceiling at the recital’s conclusion. 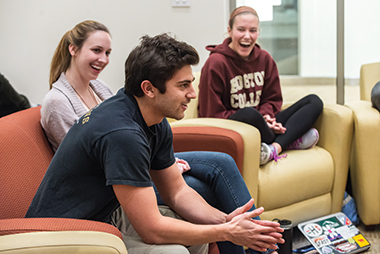 Among other facts that emerge: Bea Lynch ’18, a premed student and theology major from Connecticut, has never eaten a hamburger; Scituate, Massachusetts native Sam Murphy ’19 has never eaten a hot dog. And an infant Valentini once modeled for Huggies. The women work through the agenda: what to do as volunteers. The four cochairs explain how to direct participants from the keynote address (Riham Osman of the Muslim Public Affairs Council, on “owning” her Muslim-American identity) to the various workshops (e.g., “Fight Imposter Syndrome to Boost Your Confidence and Career” and “How to Turn a Passion into a Post-College Profession”). They brainstorm questions to ask student registrants at roundtables during the summit’s luncheon: What does owning your life mean to you? What’s one thing from the keynote that you can apply to your life? Who do you know who owns her life, and how does she do it? Thirty of 330 total tickets to the event remain unclaimed, and Valentini, gesticulating with a pen, challenges each volunteer to recruit at least one student in the next 24 hours. Fellow cochair Lily Peng ’17 explains the summit’s schedule. 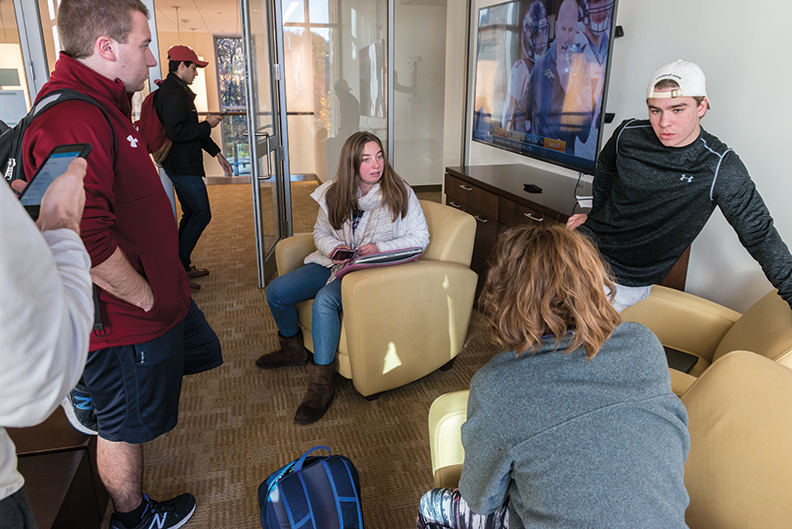 English and communication major Rose Anderson ’19 stretches her arms wide when she says last year’s summit pulled her from the “BC bubble” and “opened my vision to the future.” The room’s floor-to-ceiling interior windows open onto a hallway on the second floor, where the occasional male student glides by at a sloth’s pace to take a gander at the scene below. At 7:45, the women disperse. One walks out to the main lobby. She tosses her pink bookbag, with a blue “I’m With Her” button pinned to the back, on one lounge chair, curls up on another, and pulls out a highlighter and a printout from Scientific American. As they arrive, the 13 board members push some of the rolling white tables to the walls of the 860-square-foot room and arrange the rest into an intimate square. Out come laptops festooned with New England Patriots stickers, the flag of Thailand, and sayings like “Smile More” and “Death by Pizza,” this one on the laptop of Simi Siddalingaiah ’19, who, as it happens, is eating pizza. Tomorrow is caucus co-president Seok Won (Steve) Hong’s birthday. To celebrate, the group—seven women and six men—lob chocolate covered blueberries across the room in high arcs at each other’s mouths (only a third of the pitches miss their mark). 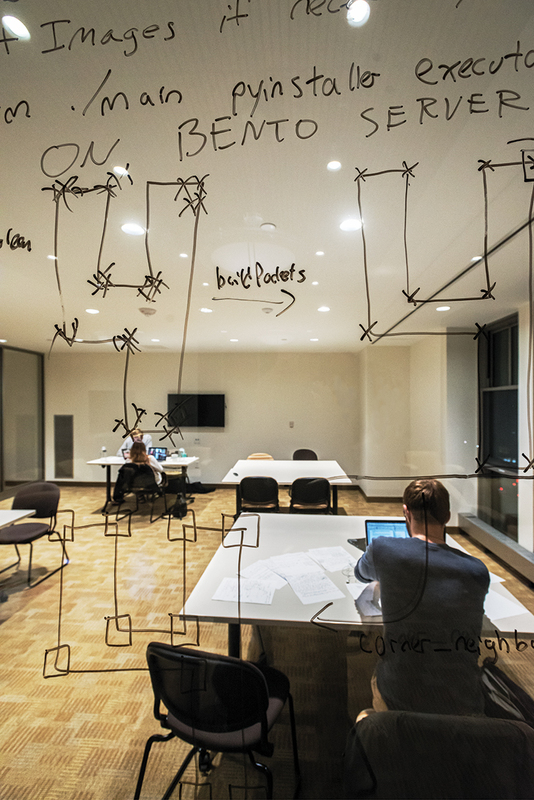 As is often the case in these window-walled meeting rooms, passing friends occasionally stop to knock on the glass and wave. 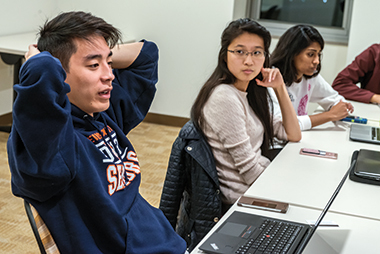 “Ignore them,” instructs Hong ’17. They move into discussion of the evening’s main agenda item: how, if at all, should the Asian Caucus respond to the election of Donald Trump? 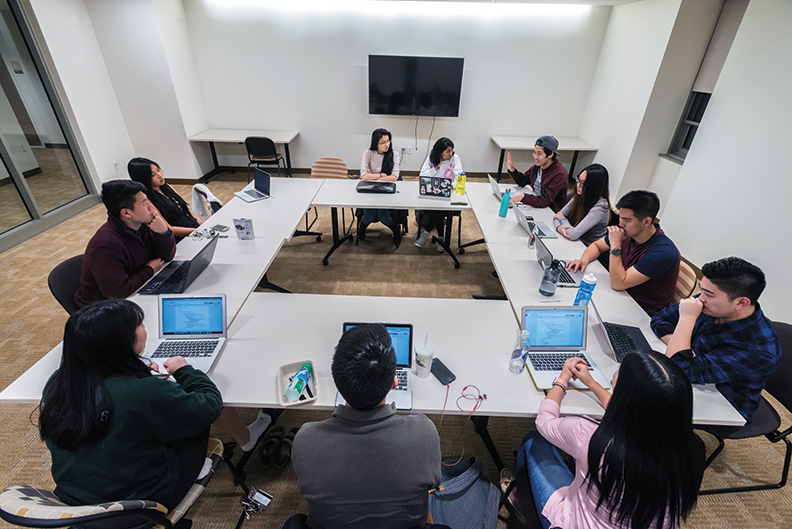 Gaoyuan Liu ’18, codirector of policy and political initiatives, notes that FACES, a student organization that hosts dialogues on race, invited the Caucus, as the point of connection for eight student organizations, to join several other cultural clubs for an on-campus “solidarity” march the following week. “It’s not against [Trump’s] presidency,” he says, “but unity against what he’s said about minorities.” An English and economics major from Massachusetts, Liu is a member of the Chinese Students Association. “It may help if we release our statement before the march,” says copresident Yoon-Shin (Clara) Lee ’17, a sociology and applied psychology major from San Jose, California, who sits cross-legged and barefoot on her chair. At that, they turn to their screens and open a shared Google Doc, on which Lee has drafted a post-election statement to the full Caucus. 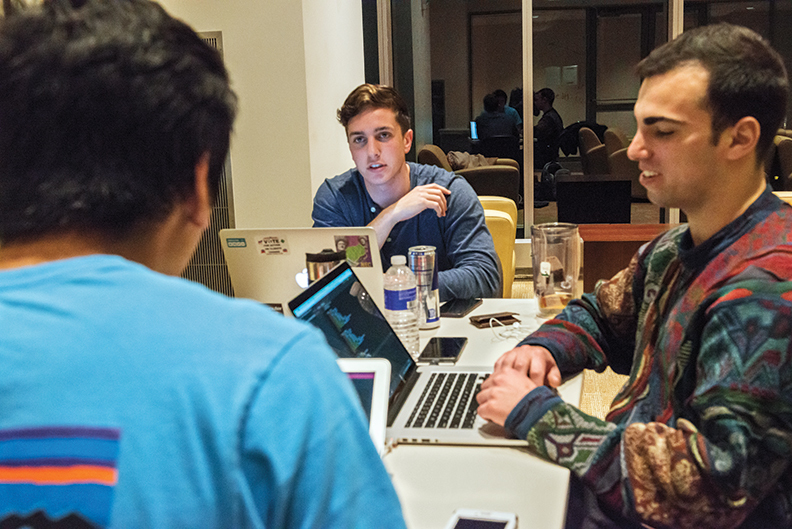 “But I think the word support is taking a side,” says media chair and finance and information systems major Henry Yun ’17, tugging the hood of his blue sweatshirt more tightly around his head. They reach an impasse. Lee decides to work through the rest of tonight’s to-do list, which includes planning a holiday charity drive, deciding which colors the Caucus should wear for their upcoming yearbook portrait (black, white, and maroon as always), which faculty members they should invite to speak at a gathering during study days about Asian-Americans and mental health (psychologists Ramsay Liem and Liane Young), and how to promote a panel discussion on Asian representation in Hollywood (create a video for social media, send the Heights a letter to the editor). Service and education director Alexander Thu ’19 sips alternately from bottles of milk, water, and Coke (he will finish all three before the meeting’s over). Community relations director Joon Yoo ’17, who lives in the building, scoots out with a white mesh bag in hand to move her laundry from a washer to a dryer. The group waits for her to return before they take up the election again. 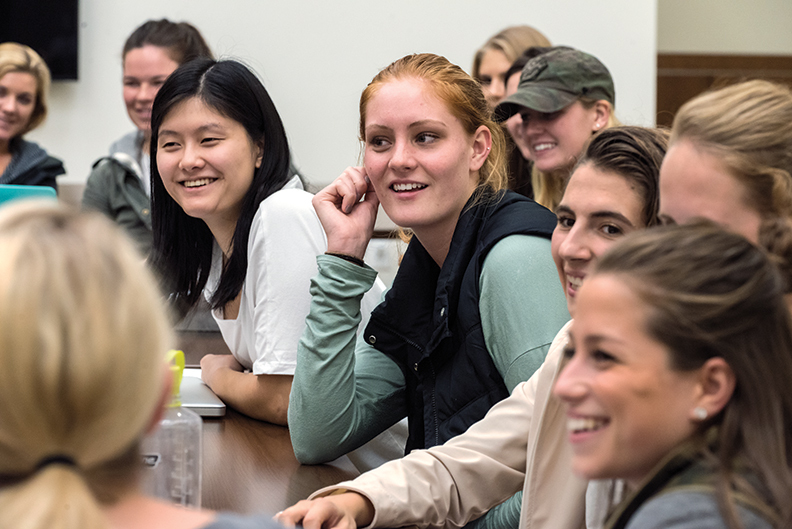 They share stories of acidic in-class arguments between students—one professor, it’s said, had ended class early when a female Clinton supporter and a female Trump supporter engaged in a shouting match. Hunched in a tan leather lounge chair, grapefruit-sized headphones covering his ears, a lone student types on a laptop. The 550-square-foot, two-story glass cube on the second floor is all his. Out the floor-to-ceiling windows the view is peaceful—burgundy-leafed tulip trees in the building’s courtyard, the knobby spires of Ford Tower peeking through beyond. Then the 11-person UN delegation—dressed in yoga pants, sweats, and slippers—files in through the double doors. They’ve got a reservation. The student gets the boot. They push the lounge chairs into a circle in the center of the room. Someone flicks on the flatscreen and puts the Broncos-Saints game on mute. Another lowers the electric-controlled blinds. 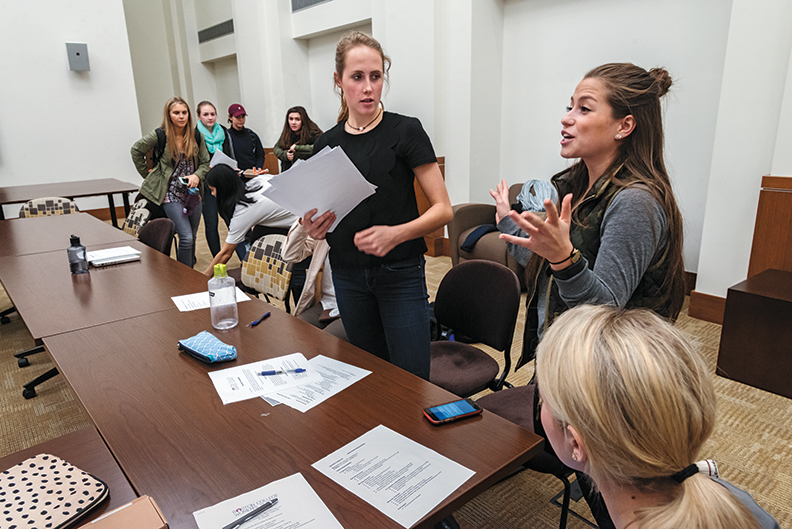 Since last April, the team has met every other week to plan the fifth annual Eagle Model UN Conference for high school students (March 17–19 at the Westin Copley Place Hotel). Creating 40 consecutive hours of international summits and global crisis simulations (from stock-market crashes to cybersecurity attacks) for 650 students from some 35 high schools in the United States, United Kingdom, India, and Panama requires writing more than 1,000 pages of rules and background guides, filming dozens of introductory videos, and building several mobile apps and websites. Under-secretary-general of political affairs Jack Massih ’17, sporting a dark gray EagleMUNC pullover fleece, introduces today’s focus: brainstorming ways to “build as much hype as possible,” i.e., keep the excitement level high throughout the conference. 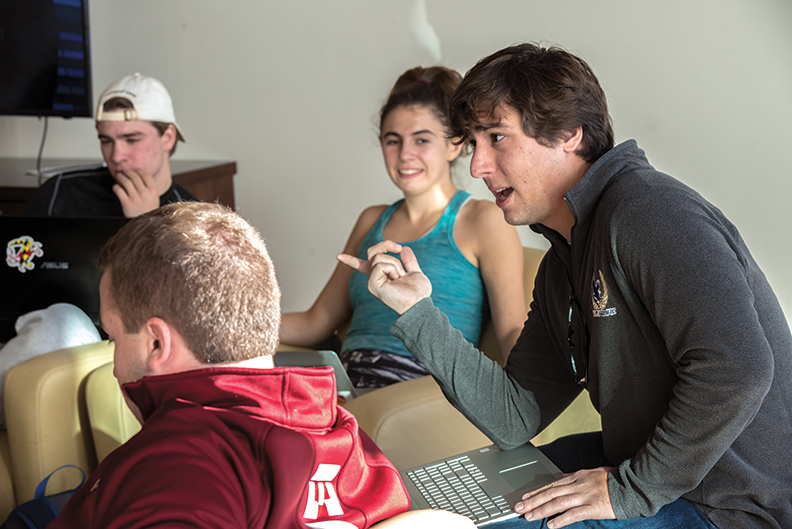 Andres Garcia ’19, director of the Mexican-American War simulation, suggests that a camera drone could fly into the mock European Union’s conference room to introduce a drone-attack crisis. International studies major Deven Bhattacharya ’19 says that the chairs in the mock British Parliament’s conference room could be arranged the same the way as the House of Commons chamber. They debate theme songs to play as each council arrives to the conference—Samuel Barber’s “Adagio for Strings” for the UN genocide committee, and, for the International Monetary Fund, Biggie Smalls’s “Get Money.” Massih proposes a “candy bribing system” for students playing the role of multinational corporate lobbyists—representing a defense contractor, homegoods provider, and telecommunications conglomerate, among 17 others. To advance their interests they can offer government representatives various treats: One lollipop = $5 million. The meeting closes at 3:30. The ejected scholar did not venture far. He’s working from a lounge chair in the central corridor. 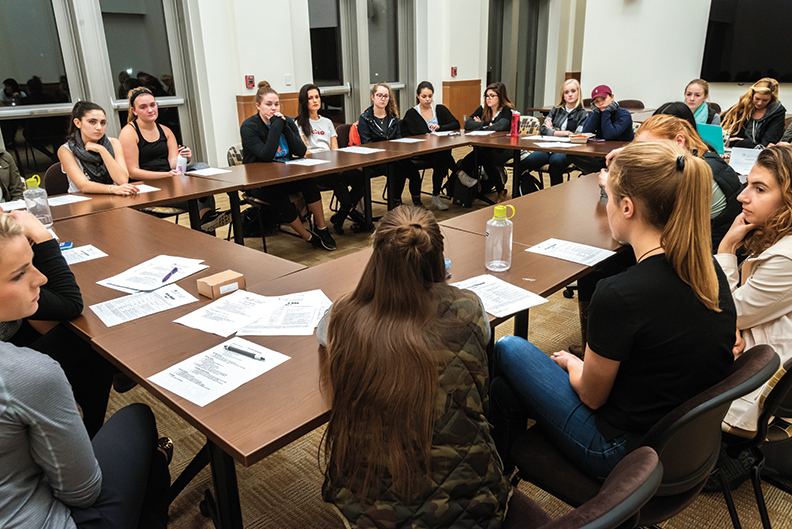 A sheet of paper taped to the lounge door notes that the room will be free until 7:00, when the student-run Dialogues on Race holds its weekly meeting. As the delegates disperse, the student heads to reclaim his territory. 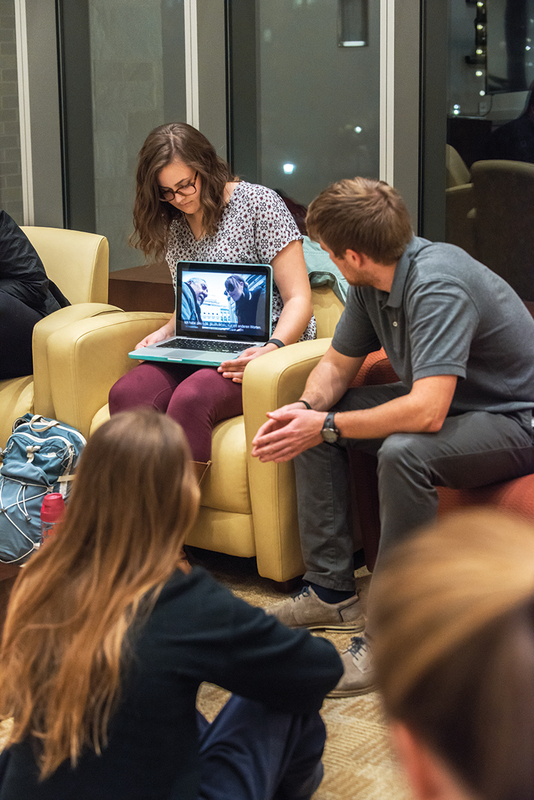 On January 1, the group will fly to the Dominican Republic for a 10-day, Jesuit-led tour of Santo Domingo and Jimaní, where they will meet with Dominican farm workers and Haitian immigrants. 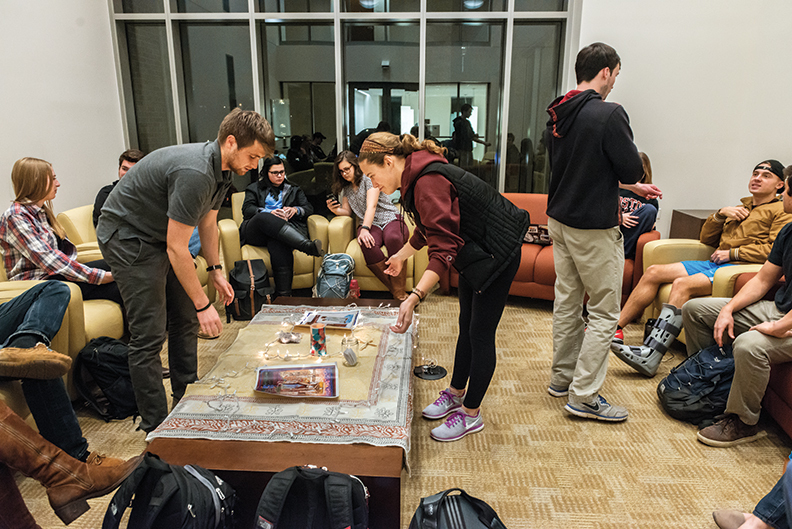 Marilu Del Toro, who directs Arrupe for Campus Ministry, says the goal of the 26-year-old program “is to help students understand how they can live in solidarity with others who are experiencing marginalization.” (In all of Arrupe this year, 125 undergraduates will visit nine locations throughout Latin America.) 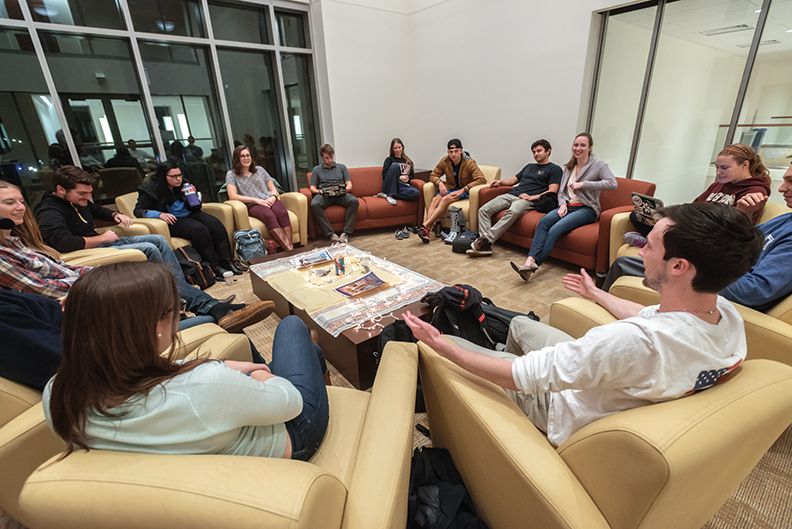 Team DR has been meeting each week since last March to discuss social justice, faith and Dominican history and culture, to organize fundraisers, and to build camaraderie. Robyn Naragon ’19, a bespectacled communication major from California, has been assigned this week’s opening prayer. She opens her laptop and plays a YouTube video about a stranger who makes a sign for a blind beggar. The students then conduct their weekly icebreaker. This time it’s a couple of rounds of the game Crack the Code, in which one person leaves the room and returns to ask questions and guess the “code” the rest of the group created in his or her absence. 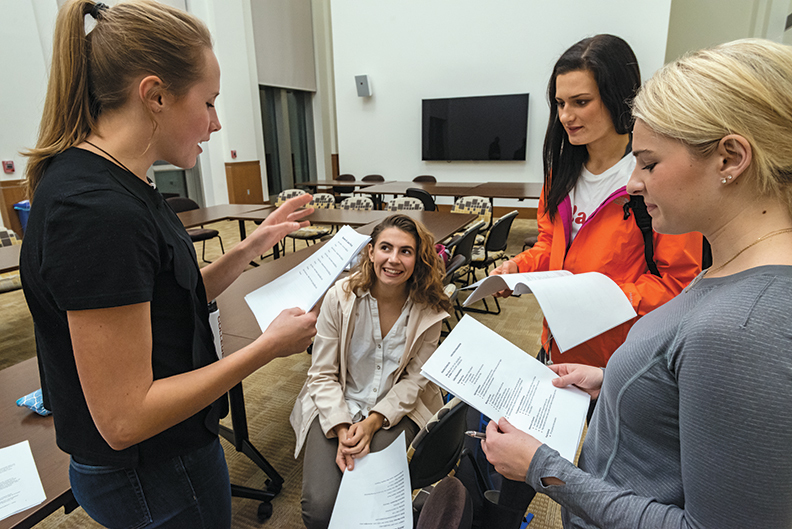 For example, when tall, buzz-cutted Joey Szopinski ’17 steps out, the rest decide that all men will answer Szopinski’s questions directly, which the women will respond in the form of a question. The information systems major asks eight questions before correctly guessing the code. Kusztos then asks whether the group would rather discuss the previous week’s presidential election or share their “high and low” moments of the past week. When they bow their heads and close their eyes for an anonymous vote, all but one raise their hands to recount highs and lows. Highs include a job offer in Seattle (“Do it!” the group encourages. “You’d fit right in in the Pacific Northwest”) and a macaroni-and-cheese dinner with an old friend. Lows include a broken leg, the election itself (one student says that when he called home the day after to commiserate “I didn’t feel supported by my mother for the first time in my life”), and the death of a childhood friend to a sudden illness. They bow their heads again in silence for a full minute before moving on to the next student. To close the meeting, they turn off the lights and turn on the 65-inch flat-screen to watch the hour-long PBS documentary Black in Latin America: Haiti and the Dominican Republic, part of a series directed by Harvard’s Henry Louis Gates Jr. on African cultural influences in the Americas. The leaders keep their laptops open to take notes. 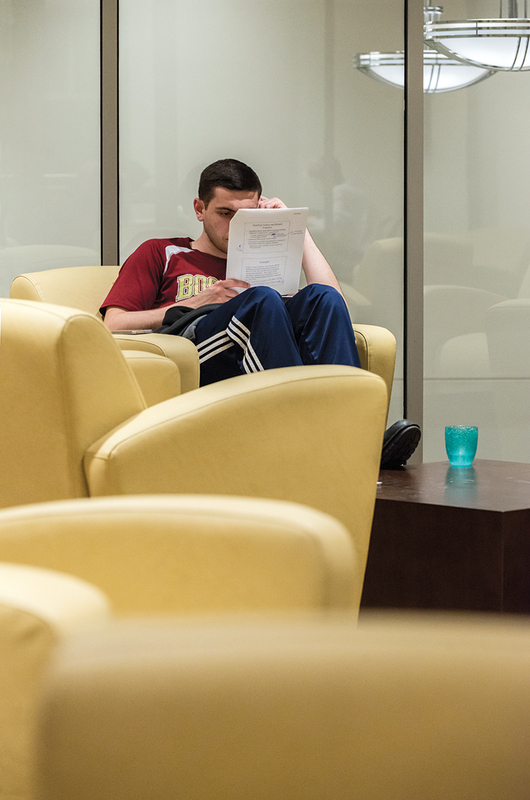 Click to view a slideshow of photographs taken in the residence hall during study days.